Vote forBruny Island, TASTop Island Destinations Which are Australia's must-visit destinations? You help us decide. Featuring dramatic and rocky sea cliffs dotted with various coves and inhabited by a wide array of distinctive wildlife, Bruny Island off the southern coast of Tasmania is an incredible concentration of nature within easy reach of Hobart. Throw in a delectable array of culinary offerings and you've got a delightful escape destination that blends enjoyment on both land and sea. This roughly 100km-long island located just off the southern coast of the Tasmanian mainland provides an excellent and diverse summary of Tassie scenery all in a relatively compact spot. Bruny Island blends the best of rugged coastal environments with rolling farmland, a huge array of ocean-dwelling animals and dramatic scenery. As a result, it is the ideal destination for short trips and provides opportunities for a mixture of both adventure and relaxation for a wonderfully balanced holiday. Bruny Island can be accessed via a vehicle ferry which takes travellers from the port of Kettering on the mainland across the waters of the D'Entrecasteaux Channel. The reasonably short journey delivers you to a destination that is fairly geographically unique. The island is divided up into two main sections – north and south – with a narrow strip of land between them, and presents a diverse array of terrain types that range from sandy beaches, to rolling farmlands, tall forests and its characteristically wild coastlines. Exploring Bruny Island can be done in a variety of ways both on land and in-ocean. One of the most popular activities are the marine cruises with Pennicott Wilderness Journeys which takes travellers on an aquatic adventure to see its distinctive and towering ocean pillars up close, and Bruny Island Safaris which allow visitors to indulge in gourmet experiences on the island itself. The island's immense array of wildlife – including seal and seabird colonies – are a wonderful sight to behold, with dolphins and even migratory whales can be spotted within the surrounding waters. For nature lovers, there are few parts of Tasmania better than Bruny Island. The enjoyment of Bruny Island isn't limited only to the seas, however; the island boasts a bourgeoning culinary scene where visitors can indulge their tastebuds on the likes of rich local cheeses, fresh oysters, locally-produced wines and various other delights. As a result, staying overnight on the island comes highly recommended as taking in all its highlights in a single day is next to impossible. Bruny Island's mixture of visual and taste sensations make it an underrated travel destination, and its relatively low-key renown on the Australian travel destination scene means you'll seldom have to fight crowds when visiting. The island boasts a slower and laid-back style of life, so if you're looking for a holiday location that provides a wonderful getaway from the urban with a sprinkling of adventure mixed in, this Tasmanian isle of delights comes highly recommended. Looking to pay a visit to Bruny Island but not sure what to do? Here are some of its most essential experiences. What's new on Bruny Island? Redevelopment at the Bruny Island Neck is set to add a new, resealed road along with a new car park and toilets for more visitor convenience. A new ferry service is set to commence to speed up transport from the port of Kettering to Bruny Island and offering more frequent trips. 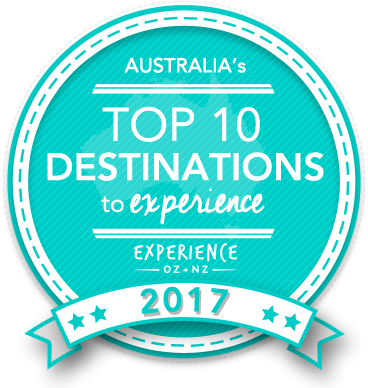 Is Bruny Island Australia's Top Major Destination to Experience for 2017? Vote now for the chance to WIN an epic trip to one of Australia's top destinations!